This interesting annual caught my attention earlier in the season, and it just kept getting better and better. As the cotton plant grows, it can be quite the conversation piece. It can be planted in the ground or in containers. It actually prefers poor and dry soil conditions. The planting at Toledo Botanical Garden (TBG) is a mass planting in the Artist Village where the cotton will be harvested and utilized by local artists. The plants are approximately 4 feet tall. The plants at TBG were grown from seed in a greenhouse. Mary Visco shared that the seeds were started in Mid-March and planted outdoors when soil temperatures were consistently about 55F. This particular cultivar was chosen for the Garden because of its short maturity date - 130 days. 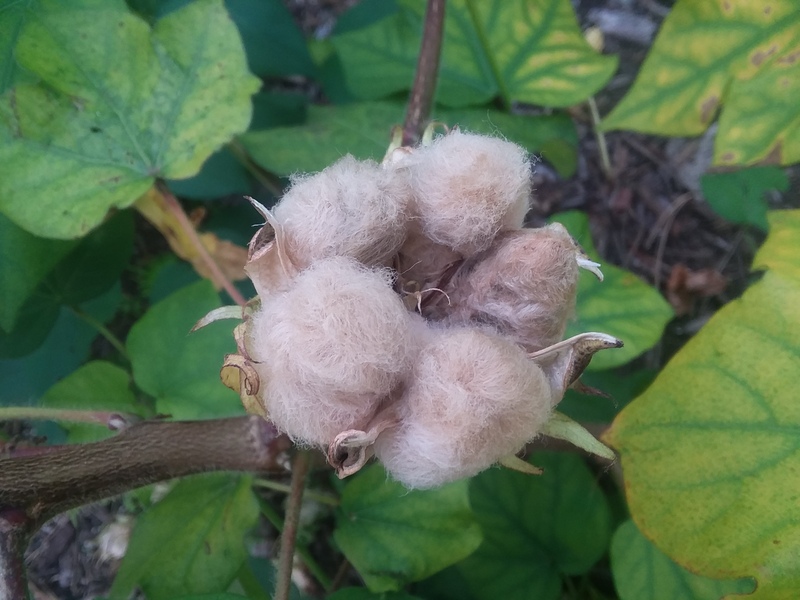 The cotton in naturally brown and has been grown since the Civil War. The flower begins white and contains both female and male parts making it a perfect flower. As the flower ages it turns pink. If the flower is pollinated, soon you will see the developing fruit. As that fruit matures, it will open, the cotton can be removed and the seeds will be inside. If you have the right site, you may consider giving this annual a try next year!